After saving tons of money on all of those great Black Friday and Cyber Monday deals, put those saving to good use and support a great charity! 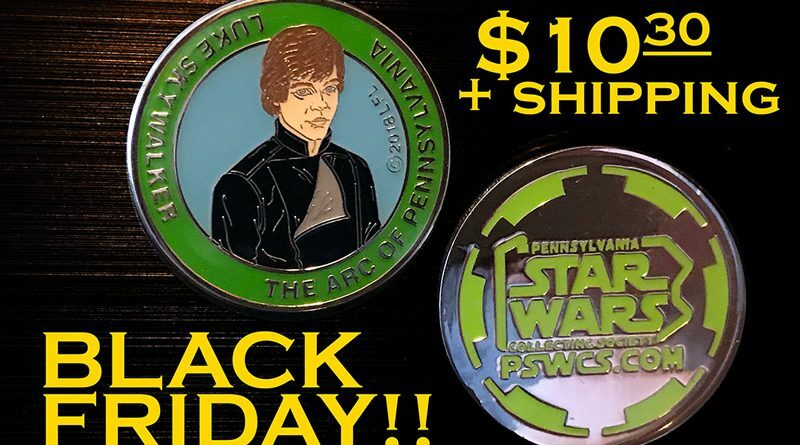 The Pennsylvania Star Wars Collecting Society (PSWCS) and The ARC of Pennsylvania have teamed up to produce Luke Skywalker charity medallions, which are now available to purchase. This exclusive collectible has a limited run, so be sure to get yours today before they disappear. Each medallion is $10.30 plus shipping in the US (international shipping available) and all proceeds benefit The ARC of Pennsylvania. This is the best way to share the wealth from all of your savings (you know you will save $100 on the best gadget out there) and the best stocking stuffer you can buy for the Star Wars fans in your life! The ARC of Pennsylvania, based in Harrisburg, Pennsylvania has 33 chapters throughout the state, and is a 501(c)(3) non-profit organization. They provide advocacy services, early intervention, housing, home-care assistance, day supports, respite and job training for children and adults with intellectual and developmental disabilities – including Down syndrome, autism, and cerebral palsy. They also provide support services for their family members and friends. The limited-edition medallion is fully approved by Lucasfilm and has an edition size of 1000 pieces. Each medallion features the likeness of Luke Skywalker on the front, along with the date and the name of the charity, The ARC of Pennsylvania. The back features the PSWCS logo. The Pennsylvania Star Wars Collecting Society was formed in 2000 to bring together collectors living in and around Pennsylvania. Club members use an email list and monthly meetings to keep in touch and share their love of the hobby surrounding the Star Wars™ films. They began their charity work in 2003 by holding annual toy drives and expanded in 2009 with the sale of their first Lucasfilm approved Star Wars™ collectible medallion. More information can be found on the web at www.pswcs.com. PSWCS.org was founded in 2013 and received IRS status as a registered 501(c)(3) non-profit organization in November 2014. The goal of PSWCS.org is to raise monetary donations to help charitable organizations in Pennsylvania and surrounding states. More information can be found on the web at www.pswcs.org. The Arc of Pennsylvania promotes the human rights of people with intellectual and developmental disabilities and actively supports their full inclusion and participation in the community throughout their lifetimes. The organization represents the nearly 200,000 people living in Pennsylvania with intellectual and developmental disabilities – including Down syndrome, autism, and cerebral palsy- as well as their family members and friends. The Arc of Pennsylvania is a leading resource for information on issues that impact individuals with intellectual and developmental disabilities. It has a statewide presence through their affiliation with 33 local chapters. Their state office coordinates strategic, grassroots advocacy efforts; provides policy analysis and trainings; and implements the statewide Include Me and the Arc Discovery Employment Transitions (ADEPT) programs that serve children and adults. Their local chapters provide a variety of critical services, including advocacy services, Early Intervention, housing, home-care assistance, day supports, respite and job training. Go Green To Support The ARC Of Pennsylvania!